Originally posted on HISTalk Practice. 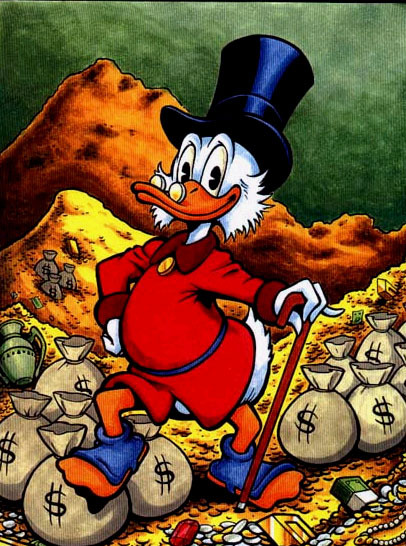 Scrooge McDuck conquering HITECH incentives. Circa 2012. Meaningful Use charts and graphs are a dime a dozen these days and as much as I’d like to add another bar or delicious pie chart to the mix, I just can’t bring myself to do it. I have no reservations about creating maps from the data though! For the uninitiated GeoCommons offers a convenient way (despite a few errors) to do some quick mapping. 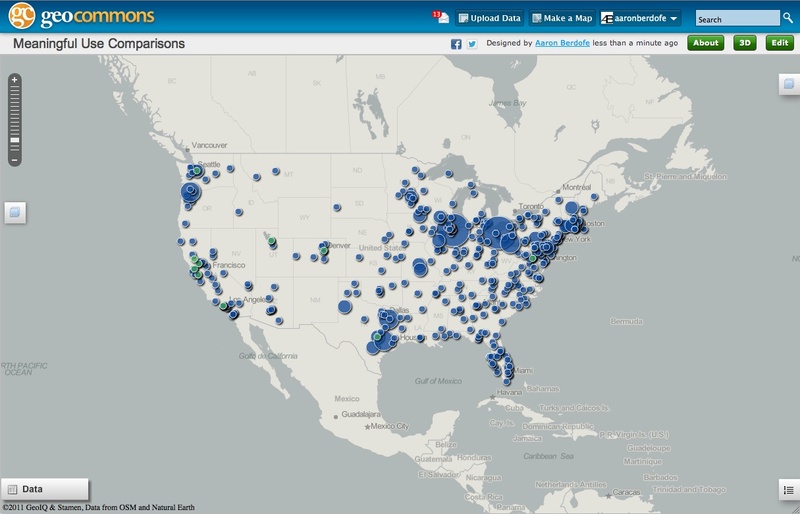 Find my map with the datasets I loaded here if you wish to follow along or play around with it yourself. But back to Meaningful Use. As you can see, the vast majority of attestations are coming from what we know to be highly populated areas. However, there are a few exceptions in places like Duluth, Minnesota, which is not known to be a bustling metropolis. To help explain some of these I brought in another data set: the locations of the HIMSS Stage 6 and 7 Hospitals. Yes, yes, I know these are EP attestations and I’m bringing in hospitals, but the vast majority of those attesting are connected with larger hospital organizations. In other words, these are all places making a lot of money and devoting a lot of money to their IT budgets. Why is this relevant? Meaningful Use is supposed to encourage those physicians that wouldn’t already be moving to an EHR to get one. Instead, those organizations that are already technologically advanced and making a lot of money are the ones doing the attesting. Maybe there’s a correlation then between EHR using communities and overall health then? The goals of Meaningful Use do specifically state that they want to alleviate health disparities and improve outcomes. Well let’s compare the attestations with the top 10 healthiest cities according one survey. Some alignment exists! Maybe the vendors are right. EHRS really do mean better health! Let’s compare with the top 10 unhealthiest cities though. Hmmm, more alignment… so the use of an EHR in a community matches with the healthiest and unhealthiest communities? Time will tell if health outcomes actually improve with Meaningful Use, but let’s give it the benefit of a doubt and say it does for second. Shouldn’t the incentives be going to the rural areas and those that don’t have a big IT budget? Right now, it just seems that those rich with big IT budgets and progressive technology are just getting, well, richer. Feel free to add your own data sets and see what you come up with!